“We are conducting classes as usual and there no threats from any quarter,” said one teacher at Highfield One High School. In Masvingo, it was business as usual at both urban and rural as teachers ignored calls to stay away from work. Teachers in Mashonaland Central were also busy with their daily duties. 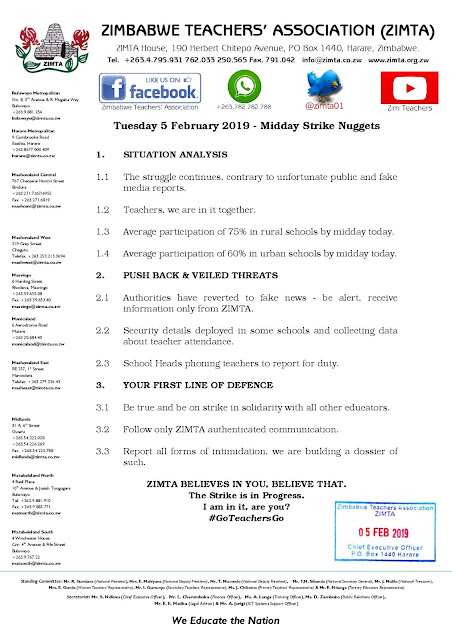 A check in Bindura, Mazowe and Guruve districts showed that teachers were busy conducting lessons with no disturbances. In Kwekwe, it was business as usual except at Kwekwe High School and Russel Primary School. Parents could be seen collecting their children at Russel Primary School as some teachers did not turn up.